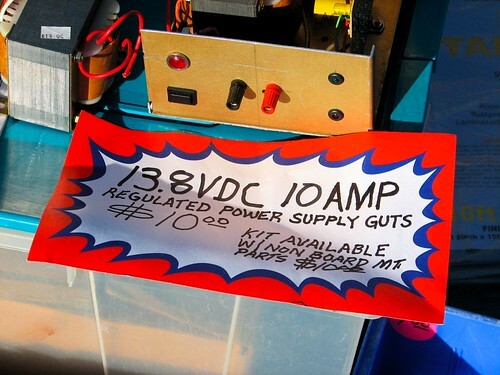 Last month we wrote about the Silicon Valley Electronics Flea Market.The next one is coming up this Saturday, April 14. As usual, it’s bright and early in the morning at De Anza College in Cupertino, CA. If you haven’t seen the photo set from the last flea market, go take a look. This entry was posted in Electronics, EMSL Projects and tagged electronics. Bookmark the Permalink. I was surprised by the number of vendors that were ready with full rain tents– looks like it really goes on rain or shine. It did seem like there were about half as many vendors as usual, though.